Ridgegear Twin Kinetic Tool Lanyard with Choke Loops and Belt. 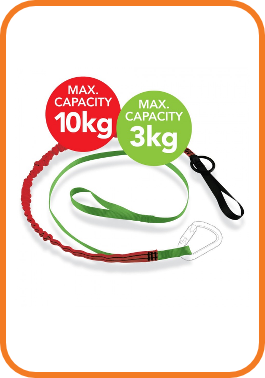 For tools up to 10kg. The RTLK3 is a twin tool lanyard with a standard and a Kinetic™, both with tool attachment choke loops and an ‘O’ ring on the Kinetic™. Standard - tools up to 3kg. Developed to reduce the potentially devastating shock involved in the event of a fall. Kinetic™ webbing significantly reduces the risk of being dragged off a platform in the event of a tool falling.